In 2015, Pope Francis invited them to fight the "ideological colonizations that try to destroy the family". The Philippine Constitution states that "marriage, as an inviolable social institution, is the foundation of the family and must be protected by the State". Legal separation and civil annulment provided for by law. Fears of the repercussions of the provision on children. Manila (AsiaNews) - "It is unconstitutional, it is against Christian faith and it is anti-family and anti-children". More than 77 Catholic organizations have joined together to oppose the bill on divorce, approved last March by the House and now under consideration by the Senate. The bill is fuelling a heated debate in the public opinion of the Philippines, the only country alongside the Vatican that does not have legislation in this area. The Philippine Constitution [article XV, section 2] clearly states that "marriage, as an inviolable social institution, is the foundation of the family and must be protected by the State". At the moment, the only options for couples who wish to end their union are legal separation, which does not allow either party to remarry, or civil annulment. Marriage can be annulled only for limited reasons, such as mental instability or the contraction of a sexually transmitted disease. Abuses and infidelity are not reasons deemed valid by the state. Only Muslims, who represent around 10% of the population, can divorce under the Islamic Family Law. Despite the opposition of President Rodrigo Duterte and the influential Catholic Church, last month the Lower House endorsed the third and final version of bill 7303. According to analysts, it is unlikely that it will receive the necessary support from the upper house , called to draft and approve a counterparty law. Duterte, legally separated from his wife, has repeatedly declared himself against the provision declaring it harmful to children and several senators have already announced their intention to tear it down. An independent poll conducted by Social Weather Stations reveals that in 2017 53% of the citizens declared themselves in favor of the legalization in the Philippines, a country with the largest Catholic population in Asia. According to data from the Attorney General’s Office, the same year the number of annulments has risen to over 8 thousand, from about 1,000 in 2008. 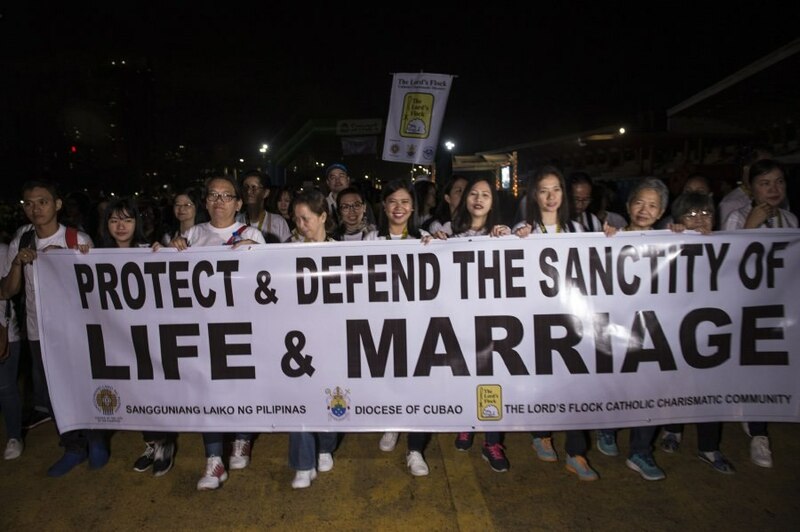 Taking up Pope Francis’ challenge to counter ‘ideological colonization that seeks to destroy the family", Filipino Catholics are engaged in a campaign against the bill. Christina Del Reys, a member of the Christian Family Movement, told AsiaNews: "Our current laws already allow marriage to be declared void or voidable. Annulment is also permitted under certain circumstances. But here there is a fundamental difference between annulment and divorce. Marriage is not a simple contract or union, but a sacrament, a covenant before God. It is a sacred union between man, woman and God to establish a family”. Robert De Jesus, of the Sacred Heart Catholic Charismatic Community, reiterates: "Divorce does not solve problems, it destroys families. Children will be the biggest victims of every divorce. They will suffer, more than their parents. Separation inflicts on children a persistent and harmful emotional, psychological and mental impact ". "Worse - continues De Jesus - when they are married, the children themselves can choose to seek divorce as an easy way out in case of marital crises. Thus, the divorce virus could be passed on from parents to their children, destroying our families and the moral fiber of our society as a whole ".